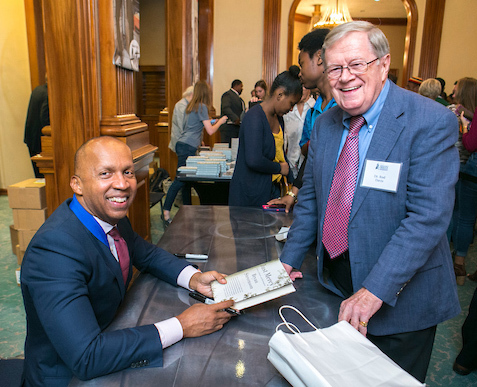 Equal Justice Initiative founder Bryan Stevenson electrified and inspired an audience of almost 2,000 in Samford University’s Wright Center Concert Hall Oct. 4. Stevenson, who has dedicated his law career to helping the poor, the incarcerated and the condemned, presented the 2016 J. Roderick Davis Lecture at the invitation of the university’s Howard College of Arts and Sciences and Frances Marlin Mann Center for Ethics and Leadership. Prison and sentencing reform remains a perpetual concern in Alabama and the rest of the world. Stevenson noted that, due in part to treating drug addiction as a crime rather than a disease, the U.S. prison population has risen from 300,000 in 1972 to 2.3 million today. He said the rate of incarceration of women has increased 646 percent in the last 20 years. Seventy percent of those women are single parents, whose children then become more likely to be imprisoned as a result of their broken families. Most shocking, he said, is that one in three black males born in the United States is now statistically likely to go to jail during his lifetime. Lawyers getting close to his own community created the opportunity for Stevenson to go to high school, and then to college. The philosophy major would have been happy to stay in college forever, but settled on law school and the promise of a career that didn’t really call to him until a course pushed him closer to someone he could serve. While spending a month providing legal services to death row inmates in Georgia, Stevenson delivered the news that a man would not be executed in the next year. Stevenson first apologized that he didn’t know anything else about the man’s legal situation, but the inmate, bound in chains, welcomed the news as an opportunity to see his wife and children without burdening them with an exact date of his death. The young law student simply brought the man hope for the first time in years. “I couldn’t believe how, even in my ignorance, being proximate could have an impact on the quality of someone’s life,” Stevenson said. Stevenson described a case in which a 14-year-old with no prior criminal record shot and killed the sleeping man who had just beaten the boy’s mother into unconsciousness. Because the man was a deputy sheriff, the prosecutor insisted the boy be tried as an adult. When Stevenson first met the boy, in an adult jail, he found a terrified child who had been assaulted so many times in the few days since his arrest that he had lost count. As Stevenson left that young client, he wondered who was responsible for the terrible situation. “The answer is, we are,” he said. He challenged his audience to join him in accepting that responsibility, remaining hopeful, addressing the past with honesty and openness, and reshaping the narratives of racism at the root of injustice. Samford has many connections to the cause of prison reform and will continue to highlight that cause in coming months. The university was founded in 1841 as Howard College, named for 18th-century prison reformer John Howard. As Alabama attorney general earlier in the century, former Samford President Harwell Goodwin Davis (1938–58) helped expose and end the state’s unjust convict lease system. In March of this year, the John Howard Scholars student organization launched the Howard Campaign for Fair Sentencing and Prison Reform. Samford’s Cumberland School of Law will host a public conversation on race and law Oct. 6, and Howard College of Arts and Sciences will offer a public preview of a new interdisciplinary course on Identity, Punishment and Control in the Prison Nov. 11.